'54 Elvis Recording 'Treasure' Surfaces - Misc. The Elvis Presley recording that helped usher in this year's 50th anniversary of rock and roll emerged again this week as one of the rare "treasures" of the record world. John Heath, an Elvis memorabilia consultant in Marion, Ark., paid $6,000 to a former Memphis woman for one of the first record ings of "That's All Right." "If it's what John says it is, it's an important piece of rock and roll history," said Jack Soden, Elvis Presley Enterprises chief executive officer. "It shows there are still treasures to be found in the world." Brian Marren, vice president of Chicago auction house MastroNet that specializes in sports, rock and roll and other "Americana" items, drew a sports analogy. "It would be like finding Babe Ruth's first home run ball," he said The song, widely hailed this summer as the one that turned rock and roll into a music form, was recorded July 5, 1954. Heath, principal of Marion Junior High School, said Sun Records owner Sam Phillips quickly cut an acetate - a demo-type record - for legendary disc jockey Dewey Phillips at WHBQ Radio. Listeners deluged the station, asking WHBQ to play the song over and over. 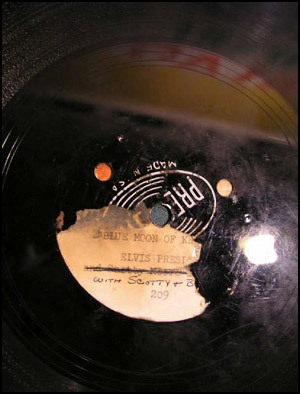 Sam Phillips then had to rush to cut a flipside, "Blue Moon of Kentucky," for the record. He then cut three acetates with both songs. One went to WHBQ, one to WMPS and one to WHHM, said George Klein, the Elvis friend who later became another legendary Memphis deejay. Heath, who has worked as an Elvis memorabilia consultant for Graceland and for Christie's and Sotheby's auction houses, said each of those original demo acetates had disappeared until he was contacted by Charlotte Clark, 63, a retired English teacher who lives in Poplar Bluff, Mo. Clark said one of her mother's friends worked for a Memphis radio station. She thinks it was WMPS. The woman gave the acetate to Clark's mother, who gave it to her. "I was probably 15 or 16. I bought the 45 (the actual record release) shortly thereafter so I doubt that I played it (the acetate) many times. I just put it in an album cover and put it away. "I don't think it ever occurred to me that it might be worth something," said Clark, until this year's 50th anniversary of rock and roll. Suddenly "That's All Right" was a rallying cry for the birth of rock. Clark said she contacted Heath, who first offered $1,000 for the acetate and told her it could be an important find. He persuaded her to give him "right of first refusal" if she was offered more. Clark said she contacted memorabilia experts from Los Angeles to New York. They upped the offer, and she finally agreed to sell to Heath at $6,000. "I think it was finally the 50th anniversary that stirred me to do something - that I should sell it or I'll be dead." As a former Memphian, Clark said she also wanted the recording to remain in the Memphis area. Klein, a disc jockey and host of "George Klein's Elvis Hour" on WSRR FM-98.1, said he plans to play a digitized version of the "That's All Right" acetate during Sunday's 8-9 a.m. broadcast. BMG Records consultant Ernst Jorgensen listened to the digitized copy this week and said the sound of the acetate convinced him it is "the original Sun sound." RCA Records, which bought Elvis's Sun recordings, altered the originals by adding "reverb" and other effects to them. The sound on the acetate "has not been made public since RCA took over the Sun masters," he said. Clark said she doesn't want to find out if the recording is worth hundreds of thousands of dollars. She plans to use her $6,000 to carpet her house, and that's all right. if this is true why doesnt e.p.e. pick it up? I think we will find out that this is worth more than 6,000 dollars. So, do we know if this one is the original one-song acetate or one of the 3 two-song acetates ?